The swimming pool, club house and picnic area are located at Cypress Spring Parkway South near the Cypress Springs Elementary School. Entrance to the pool and club house requires a key issued by the management company. 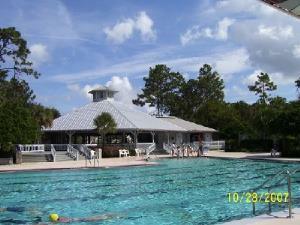 New owners may obtain a key and tag to the pool and tennis court area by contacting the Property Management Company. A private security company is employed starting on Memorial Day Weekend to monitor the recreational facilities throughout the summer season. The pool furniture is in storage until the summer season when the area is supervised by an attendant. The bathroom doors are locked to minimize damage or loss related to vandalism. The swimming pool is open from dawn to dusk. Click here to view or download the form required to obtain a pool key. If interested in reserving the clubhouse see clubhouse details. You may contact Stephanie at 407-901-7555 to request a pool key.